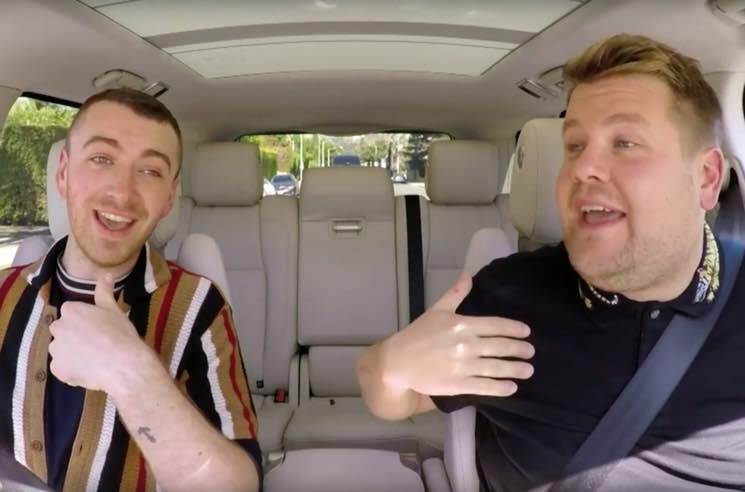 Sam Smith is the latest star to get picked up in James Corden's car, appearing in last night's (November 1) "Carpool Karaoke" segment on The Late Late Show. The pair crooned their way through Smith's tunes like "Too Good at Goodbyes," "I'm Not the Only One" and "Money on My Mind." Smith even revealed his plans for future retirement — going off his diet, living in kaftans and oversized sunglasses, never leaving his house and spending all his time just flipping through photo albums of his past success — and admitted to skipping school back in the day to attend a Lady Gaga concert. Midway through the ride, Smith admits that he's a Fifth Harmony superfan, and moments later, he's joined by girl group in the flesh. Together, Smith and Corden almost make a decent substitute for former member Camila Cabello. Sure, it all looks like a good time — but give it a week and Smith might just pull a Foo Fighters move and tell us how fun the filming really was. Watch the new "Carpool Karaoke" clip below. Smith's sophomore album The Thrill of It All arrives tomorrow (November 3) via Capitol. Pick up a copy via Umusic.